The promotion is expected to run for the next 45 weeks. The plans for this promotion was unveiled by Chief Executive Officer (CEO) Clare Keizer, who indicated that along with its co-sponsors Bickles, Courts St. Vincent Ltd, Jujube Bookstore and Digicel, one of the objectives is to ensure that reading and literacy are put on the front burner. 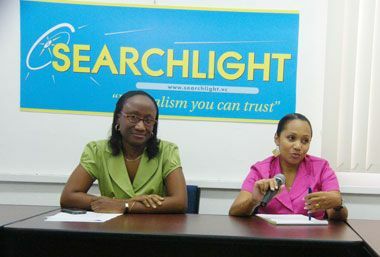 Keizer also stated that another of the promotionâs objectives is to reward the readers of Searchlightâs Midweek edition, which has been in circulation for the past eight months. She said that the paper, which is circulated on Tuesdays, has been enjoying tremendous success, despite the fact that the concept of a newspaper being available any other day than Friday is new to many Vincentians. According to the CEO, every Monday by 8pm, five Searchlight Treasure Hunt questions will be placed on an accessible part of the paperâs website (www.searchlight.vc). The answers to these questions may be found by reading the articles in the Searchlight Midweek edition the following day, Tuesday. Readers will have until noon on Wednesday to email their answers to the Treasure Hunt coordinator Molicia Charles (moliciacharles@searchlight.vc). Each reader may enter once per week, and the first four winning entries with all five correct answers will receive a prize from one of the four sponsors. The prizes include a gift from Courts, $25 Digicel cell phone top up, a $20 gift voucher from Jujube, and a $10 patty meal from Bickles. The names of the winners, along with the prizes won, will be published in the Weekend edition of Searchlight (Friday); and at the end of the promotion, the reader with the most correct entries to the competition will receive a grand prize, yet to be identified. Representatives of the sponsors endorsed the paperâs newest initiative, each commending the Newspaper, and indicating that improving the level of literacy in St. Vincent and the Grenadines is part of their overall focus. The sponsors said that they were excited to be a part of the promotions and offered the newspaper and readers best wishes. Keizer noted that the promotion, which is the first of its kind, keeps the newspaper in tune with its original mission.